If the revision ID has changed since the document was first opened, the user is more likely to be facing an edit conflict, and may have deliberately reloaded the page to get the latest wikitext. 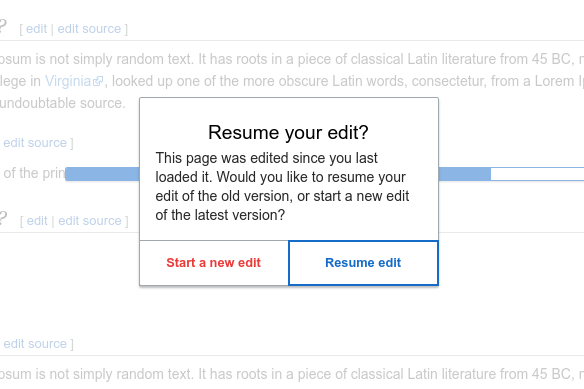 In this case we can prompt the user if they want to restore their changes, or load the document from scratch. I was imagining a non-modal prompt, more like e.g. the find and replace "dialog". Similar to popup opening prevented feedback in Firefox. I think blocking the editing of the document until the user chooses which version they want to edit makes sense. This is the same way Word/LibreOffice does document recovery, so will be familiar to users. It's also simpler from a technical & performance point of view. I agree with Ed. It's not sensible to let users do other things before picking which document they're editing. @Esanders Your comparison with Word/LibreOffice makes sense, let's see how the user feedback is.